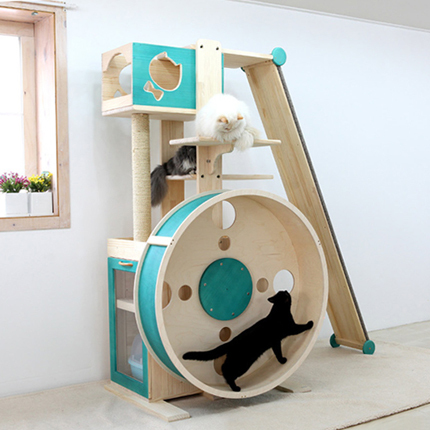 The Cat Tower provides a chance for your cats to climb, jump, and perhaps even spin (from Catwheel). While most of our cats are curled up on the couch, at least a handful of them appear to be lounging in stylish, creative, and even well-designed furnishings that would put many couches to shame. This new wave of cat furnishings goes beyond the commonplace cat tower or scratch pad covered in non-descript carpet fragments that bored your cat within an hour. Even the most indifferent cat would be curious about a host of astounding feline furnishings with massive turning wheels, sky towers, cat beds, toilet towers, neo-futurist scratching pads, cat tunnel sofas, and wonderful pieces of cat-climbing sculpture. For those of us concerned about design, LazyBonezz’ Metropolitan pet bunk bed (in ebony or fire red) is typical of the new goods that will accommodate your pampered cat (or trim dog) in a sleek wood and stainless steel bunk bed accessed by skid-resistant steps and outfitted with microfiber cushions. 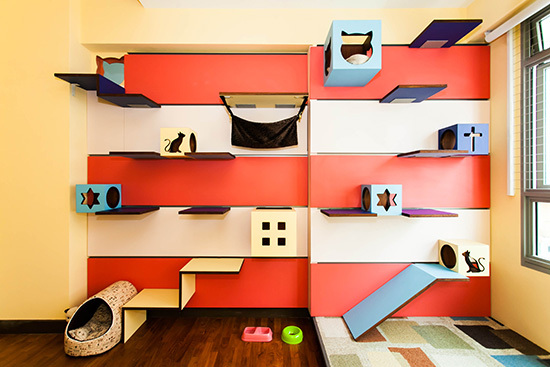 A precious few cats are even more fortunate to have the run of houses designed to turn people spaces into three-dimensional volumes accessible to cats via ceiling-suspended walkways and climbing walls. Wohnblock’s cat tower aspires to double as a piece of domestic sculpture (image from Wohnblock). The Padpod may not conform to every household’s existing decorative scheme (image from Padpod). On the one hand, this casts our cats’ material things as part of our human domestic environment and statements on our own stylishness. At some level, these well-designed things like a cat hammock may simply be commentaries on our own stylishness: that is, instead of the jarring sight of plastic litter tubs, our cat’s things now receive the aesthetic attention the rest of our tastefully furnished home receives and our cat can share our own bourgeois aspirations. 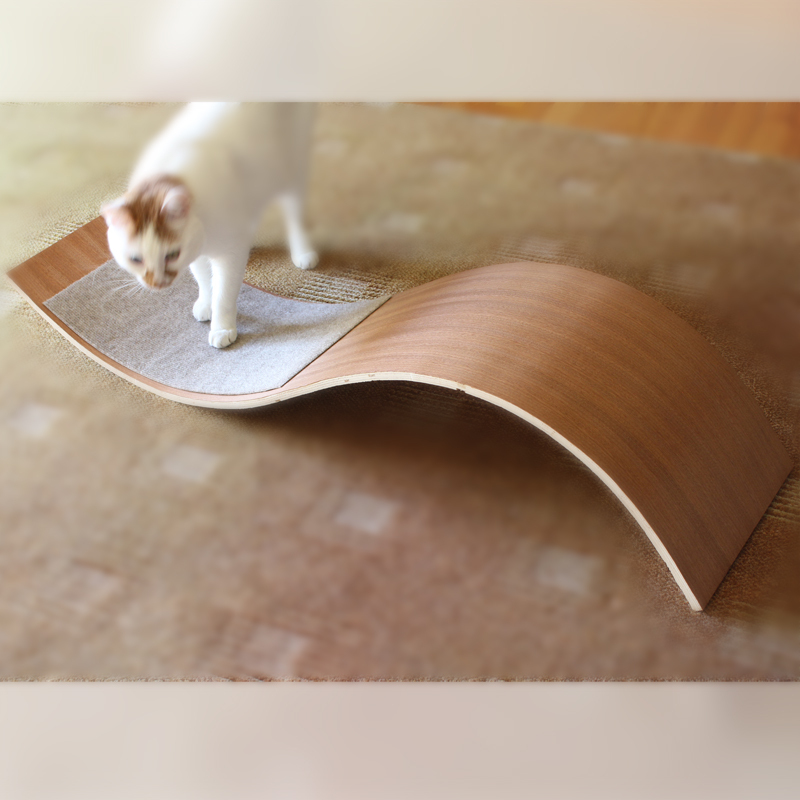 The Oscar Cat Rest is a neo-Futurist inspired scratch pad that “pays homage to the beautiful organic architecture of Eero Saarinen” (image from Davies Decor). On the other hand, though, it is not clear that many pet owners are especially torn over how the scatter of cat toys, beds, and litter boxes in our homes diverge from high-style dictates or confirm our middle-class standing. Rather than focus on the expense of cat style or its commentary on our own stylishness and class, we might instead examine how cats profoundly shape how humans perceive their own domestic material spaces. Much of the appeal of cat accessories is the sheer humor their design induces, especially when paired with the manic curiosity of a cat. The sight of a pet in a bunk bed or suspended pod is its own spectacle of unexpected aesthetics. Many of us would love having a cat condo, and we have numerous toys littering our homes, but this is less because we want to entertain the cat than because the cat’s play entertains us. 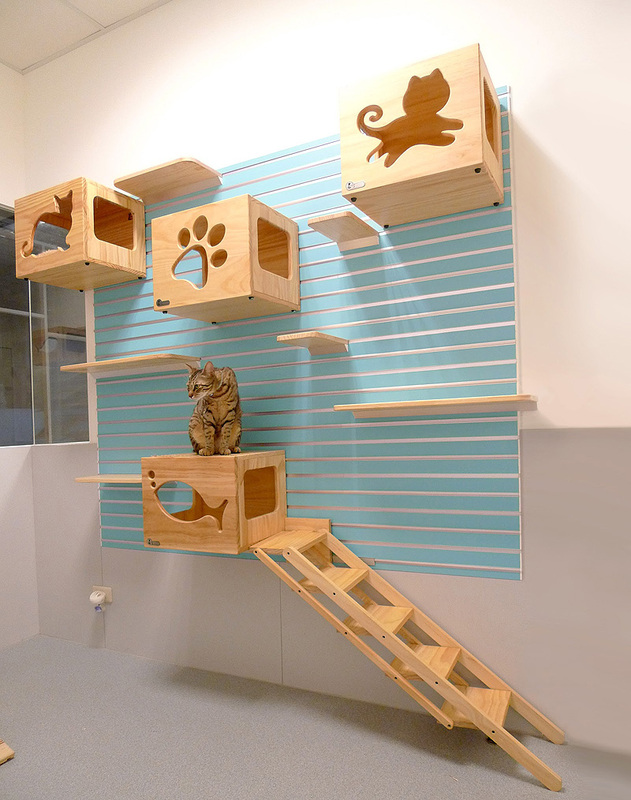 A modular cat-climbing wall (image from Cats Meow). One of the unappreciated things cats do is compel us to see domestic space in new ways as they scale bookcases, remove and inspect inaccessible things, and root about beneath the bed. That spectacle is enormously magnified by things like enclosed wheels or cat-climbing walls that help us see our familiar domestic interiors in new ways. Focusing on expense or emotional pampering risks ignoring how the sheer kinetic motion and the aesthetic spectacle of a cat’s motion through a house breaks from normal human movement. A comparable range of material things exist for dogs, and dogs pose their own re-imaginings of household space as they dive into trash cans or aspire to join us in bed, but dogs tend to be more ground-based than cats. Some lucky cats have the run of this house design by J.En & C.Rand. Possibly the most fortunate cats live with people who unleash their cats’ instinctive curiosity to explore the house anew each day. Increasingly more homes have been “catified” with idiosyncratic ramps, moving items, and passages spaced throughout the three-dimensional volume all our cats imagine the house to be. These cats embark on each day with a mission to climb a wall, ascend a cat ladder, or watch over the yard from the security of a window-sill shelf. All of this material culture does not change the fundamental emotional appeals of having a pet, and the astounding expense of some of these cat accessories inevitably ensures that they are comments on wealth and affluence. Nevertheless, these things underscore how cats shape how we see our own material space, the spectacle of unpredictable motion, and the sheer fun of having an animal companion. Posted on January 20, 2015, in Uncategorized. Bookmark the permalink. 1 Comment. Nothing at all to do with City Screens and seems a strange re-entry to blogging, which I must admit keeps slipping off my overly crowded priority desk, but am a big fan of Paul Mullins’s archaeology and this posting is a must-read for anyone who still thinks archaeology is just about digging….